Highlighting small, independent brands and emerging designers is what we do at Estila. And so it’s nice to come across, and support, other passionate businesses who are trying to do a similar thing not in media but in retail. Ruth, Estila’s contributor, spoke with Featherstone London, established by Master tailor Craig Featherstone and born out of his devotion to maintaining very high standards in the tailoring industry and preserving ‘pure bespoke’ traditions. Craig has been tailoring for 25 years and has spent the last decade on Savile Row. A Master tailor in the true sense – being that he can create every stage of a bespoke garment from start to finish. This is quite rare in the tailoring world to be so proficient in every element of the craft. He has worked with many prestigious clients ranging from presidents to business professionals and celebrities. Craig’s wife, Julie is also a company director. She has spent the last 20 years working in the media. From print journalism to radio reporting, TV production, PR and publicity. She has a strong business acumen and a marketing and advertising degree. Craig – I realised I had an interest in fashion as a teenager. I attended fashion college, where I excelled. It was funny as I was the only boy in the class but all the girls would ask me to teach them to sew. I realised I was actually very good at it. I then gained an apprenticeship with another Savile Row trained master tailor called David Chambers – I was his only apprentice so he taught me how to make everything which is really unusual in my trade as most people specialise in one thing. A decade ago I decided I had to venture onto Savile Row and when asked what I could make, my reply was ‘everything’. They thought I was joking. My knowledge and experience in tailoring meant I quite quickly made my way up the ladder and within 3 years became company director for one of the most established tailoring shops on the row. Julie – I had an interest in Journalism from a very young age. I did some work experience with a local newspaper and got 2 articles published. I realised a career in the media was a good route for me. I went to university and did a marketing and advertising degree and was good at the business modules. I joined Sky News in 2001 and quickly progressed on the production side. I now work for Sky Sports but my goal has always been to be my own boss. Craig – Sustainable and ethically sourced clothing is at the heart of what we do and all of my bespoke garments are designed and made in the UK. With a Featherstone London bespoke suit, it has to be the best for me to put my name to it. I created Featherstone London because most tailoring houses on Savile Row are owned by people who aren’t tailors and don’t understand the craft the way that I do. 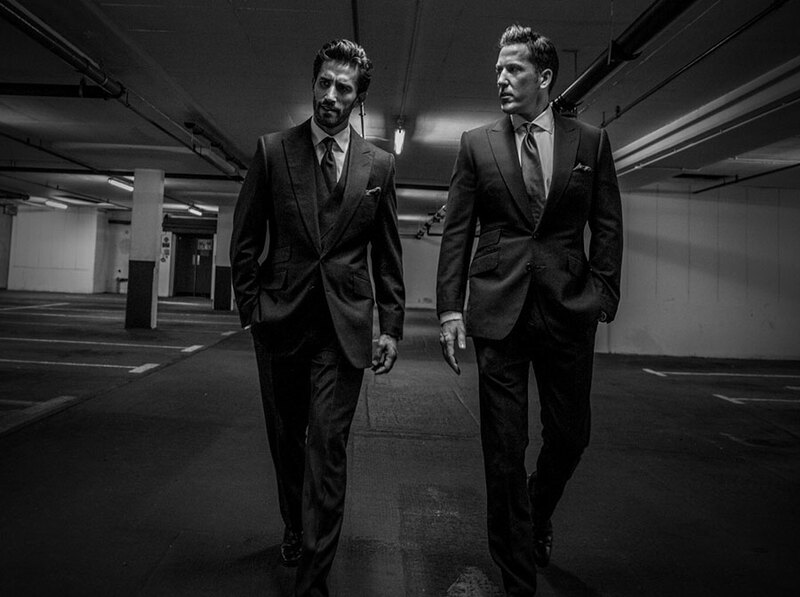 I know what I am capable of and truly want to produce the best tailored suits in the world. My focus is on quality over quantity and the only way I can actually achieve this is through going solo. Tailoring needs to get away from the stereotype of being old and stuffy. I bring a fresh approach for the modern man. Many people choose brand names over quality and I want to prove that traditional clothing and craftsmanship can still look stylish if the person creating the suit has the right eye for it. How did you get interested in sustainable and ethical fashion? Craig – Julie was working with an anti-trafficking charity called Sport for Freedom. I was helping them organise a gala dinner and some of the facts I was hearing really shocked me. The amount of children and women that are trafficked to work in factories in such awful conditions, just so that large brands can manufacture cheap ‘disposable’ clothing is appalling. People wear them once and literally throw them away. Did you know that fashion is the second biggest polluting industry in the world?! I want to educate people to think about where their clothes came from and who actually made them. If more people focused less on the price tag and more on the facts, some of the large high street chains wouldn’t be in business today. We all have a part to play in creating change and stopping these atrocities. Can you explain in more detail how to be sustainable and ethical? How do you monitor the supply chain when sourcing fabrics? In tailoring 90% of trade is bespoke so there is no wastage. It’s mainly by order only so we don’t have to hold any stock. Most of the tailoring fabric mills we use are in the U.K, Scotland or Ireland so we know exactly where the supplies have come from. Bespoke tailoring is certainly sustainable. In the trade, it’s not unheard of for people to have had their suits for 60 years or more which they pass on to their children and grandchildren. If made properly, by a good tailor, a well-made suit can last a lifetime. Don’t just focus on the price, see it as an investment, like a piece of art it gets better with age. I have some suits 20 years old and they still look great. If you keep it classic, it never dates. We have found it very difficult with accessories though. 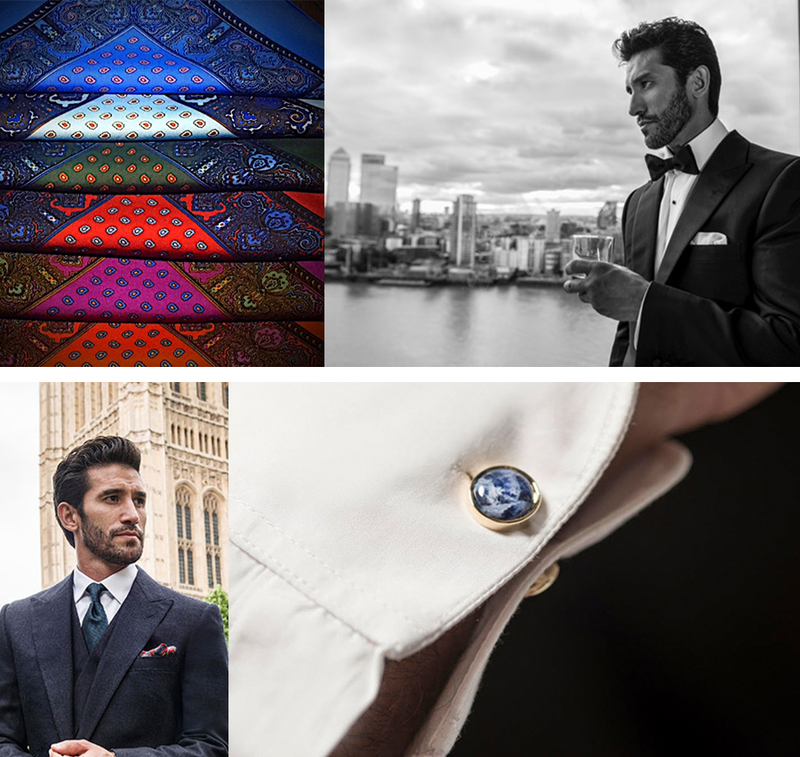 We have created our own range of ties, pocket squares, belts and cufflinks and found that making sure everything is made in Britain is extremely costly, which is why many brands have to manufacture abroad. We are following organisations like Eco-age who are educating and encouraging the fashion world to go green. Beulah London have created their ‘pay it forward’ scarves, which are printed by victims of trafficking in India and money from every sale of the scarves helps fund protecting and housing these victims. I would also like to do the same with my own range of pocket squares. This is a collaboration we would definitely be interested in, it’s important to always give back. The world would be a better place if more brands would be mindful of their supply chains rather than profit margins. As ethical fashion is gaining momentum, companies have to be more transparent. How can you be more transparent with your brand? Knowing where your products come from is an absolute must for a brand. We are currently sourcing shirts in Spain. Whilst it’s fine to buy from abroad, we need to know more about the factories and how they manufacture, so we will be visiting it in person before placing an order. All our bespoke garments are made in Britain, by Craig, so we have full control over this element. We have even gone as far as to check our packaging is made in UK and is recyclable. It took a while to find it though, within budget. We are still paying a premium but at least it’s in keeping with our brand ethos. We would rather pay a little more knowing it’s ethical. There is a huge fashion revolution occurring, people are becoming more aware of ethical labels and what that means. As a consumer, if you are more considered and buy the right clothing rather than impulsively then you don’t need to replace items every year, they will last. You can update your wardrobe in so many ways with different accessories. We really don’t need more stuff as a society, we just need to make more informed choices and choose better made clothing. The good thing with bespoke tailoring is that items can be altered when people lose or gain weight as we leave enough material to allow for changes in body shape over time. We will be seeking to obtain our ‘green carpet’ GCC accreditation from Eco-age. This brandmark is awarded to organisations who can prove and guarantee sustainable excellence. Craig – I’m totally committed to being the best, I always have been. As a child I was interested in karate but I couldn’t just stop at one black belt. I learnt so many different forms of martial arts to get to black belt status in all of them just to prove I could. I have a determination to reach the top in whatever I do. Many people are happy to stop at one thing but not me. I have such a clear vision on how I want my brand to be and will never accept substitutes. If someone tells me something can’t be done I will go out of my way to prove it can! Julie – We have already made it to the top of our fields in our individual chosen professions, so we know we are capable of success. As a husband and wife team both of us are hugely ambitious, together we are a super force! Craig is very talented and quite unique in his field. He is so particular about how things should look that I knew we could create a strong brand identity, we are a perfect team – I don’t get involved in the design or creation that’s solely Craig but when it comes to product development, organisation and PR that’s my domain. Craig – Generally, gentlemen who really want to look and feel their best and whilst a bespoke suit is a luxury garment that comes with a premium price tag, my customer understands and appreciates the craftsmanship that goes into it. Knowing that you are wearing a one-off piece made specifically for you and no one else, makes that garment more valuable and as unique and individual as the person wearing it. When I make a suit, I put a small label inside with their name and the date it was made. It’s your own piece of history. You can’t put a price on that. How fulfilling has it been setting out on this journey of starting Featherstone London? Julie – If you’re not passionate about what you do you will never achieve greatness. You don’t just fall into something you have to work at it, but that work should be enjoyable. The second you stop enjoying your job it’s time for a change. We have enjoyed every minute of this journey and are excited to see it grow. Craig – I have always loved tailoring and the timing is so right for me to go it alone. Only I know the vision that’s in my head and I can’t wait to show the world what I’m really capable of! I haven’t spent 25 years learning everything about my craft for nothing. Now is my time! Do you have plans to branch out in the future, creating bespoke products other than fashion? Julie – We have a unique opportunity to display our brand in a new shop in Manhattan which sells various British made luxury products so we are investigating other lifestyle items we can add to extend our line at the moment. Possibly to include some homeware, bespoke cushions etc. Craig – I have been asked in the past to make a bespoke pinstripe cover for the grand reveal at the Paris car show of the Aston Martin one77 so I’m no stranger to unusual challenges. As a pattern cutter I can turn my hand to (almost) anything. At the moment I’m sticking to what I know best, which is sartorial menswear but I have done some interior design too as I have also been property developing for the last 15 years as a hobby. I love planning ideas and decorating each project, so anything that involves fabric, aesthetics and proportions definitely has my interest. For more information please visit Featherstone London website. Interviewed and written by Ruth Daniels from Milla Decor. Find other inspiring stories in ESTILA EDIT 25.